We know you’re hard at work on those ACA Forms that are due to your recipients by the end of this month, so we wanted to make sure you had all the information you need. One of the most important parts of the Form 1095-C is how you indicate data about the coverage you offered each employee. You do this using Code Series 1 and Code Series 2 in lines 14 and 16 of Form 1095-C. The IRS then reviews these codes to make sure you have everything running smoothly and compliantly with your ACA employer requirements. In line 14, you’ll encounter Code Series 1 - Offer of Coverage. The code you choose in line 14 indicates to the IRS and your recipient certain details about the healthcare coverage you offered that specific recipient. You’ll need a code for each month, and the codes indicate whether the coverage you offered met minimum essential coverage (MEC), minimum value (MV), and dependent coverage guidelines. -Code 1A. Qualifying Offer made to the employee, their spouse, and dependent(s), if any. -Qualifying Offers provide MEC at MV with the Employee Required Contribution being no more than 9.5% of the mainland single federal poverty line, as adjusted. -Code 1B. MEC offered at MV to the employee only. -Code 1C. MEC offered at MV to the employee and their dependent(s). -Code 1D. MEC offered at MV to the employee and their spouse. -Code 1E. MEC offered at MV to the employee, their spouse, and their dependent(s). -Code 1F. MEC offered that did not meet MV to the employee, their spouse, and their dependent(s), or any combination thereof. -Code 1G. MEC offered to a non-employee or a part-time employee. -If using, Code 1G, you must enter it for all 12 months. -Code 1H. Coverage was not offered to the employee. -Code 1I was used to report conditions exclusive to the 2015 tax year, so it has been reserved for future years and should not be used. -Code 1J. MEC offered at MV to the employee and conditionally offered to their spouse. -Code 1K. MEC offered at MV to the employee and their dependent(s) and conditionally offered to their spouse. In line 16, we have the Code Series 2 - Section 4980H Safe Harbor Codes and Other Relief for ALE Members. This is where you’re able to explain a bit more about what you’ve entered in line 14. Unlike line 14, line 16 may be left blank if none of the Code Series 2 codes apply to your recipient’s situation. -Code 2A. The employee was not employed during this month. -Do not use code 2A if the employee worked even one day during the month. -Do not use code 2A if the employee was fired. -The employee was not working full-time during this month. -The employee was not full-time and did not enroll in coverage. -The employee was full-time but coverage ended only because the employee resigned. -Code 2C. The employee enrolled in the coverage offered. -Do not use code 2C if code 1G is in line 14. -Do not use code 2C if the coverage did not meet MEC. -Do not use code 2C for months a terminated employee is enrolled in COBRA continuation coverage. -Code 2D. The employee was in a section 4980H(b) Limited Non-Assessment Period or an initial measurement period during this month. -Code 2E. The multiemployer arrangement interim guidance applies for this employee for this month. -Use code 2E in place of any other Code Series 2 code that may apply. -Code 2F. Section 4980H Form W-2 safe harbor was used to determine this employee’s affordability. -Code 2F must be used for all 12 months. -Code 2G. Section 4980H federal poverty line safe harbor was used to determine this employee’s affordability. -Code 2H. Section 4980H rate of pay safe harbor was used to determine this employee’s affordability. When you e-file with ACAwise, you can opt for our Automatic Code Generation feature and bypass learning all about these code series and their individual codes. Just provide the information you have on your employees’ health insurance offers and our program will do the rest! 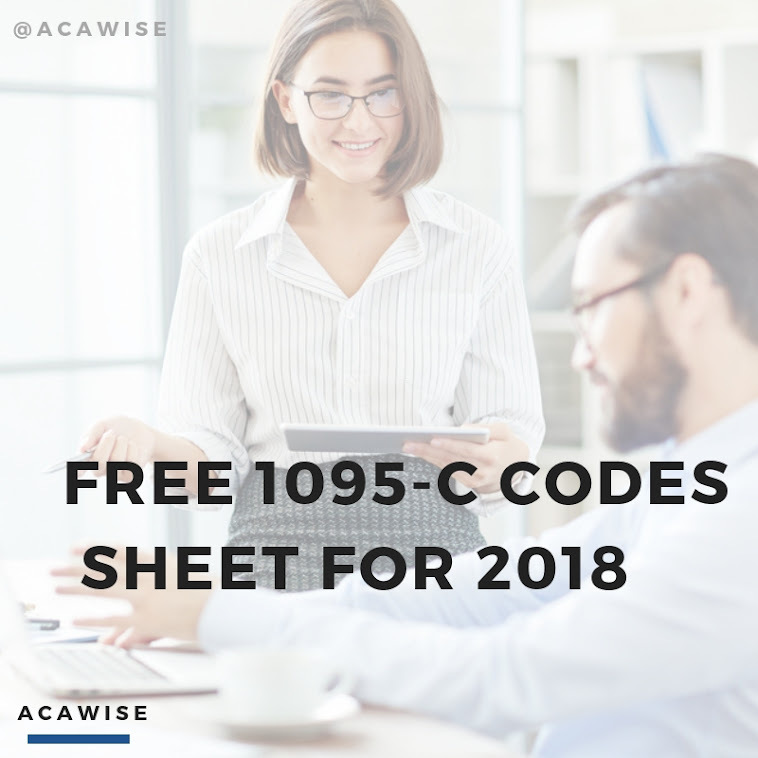 Based on that information, we’ll make sure the right codes are in the right places on your 1095-C Forms. To get started or schedule a free demo, don’t hesitate to contact our customer support team in Rock Hill, South Carolina! We’re available Monday through Friday, 9:00 a.m. to 6:00 p.m. EST by phone (704-954-8420) and live chat. We also provide 24/7 email assistance at support@ACAwise.com.